Known as the ” Wizard Cornetist” in an era when concerts in the park were as popular as rock concerts are today and community bands numbered in the tens of thousands,1 John Hazel returned to Williamsport, Pennsylvania in 1907 upon his retirement as a performer and lent his considerable musical expertise to local musical activities. He wrote and arranged numerous compositions for performance by the Repasz Band. Some of his most famous marches are still performed today. In 1995, the Repasz Band and Williamsport’s Scottish Rite Imperial Teteque Band featured a guest trumpet soloist, Dr. Mark Murray, as a fund raising effort to provide a permanent interactive exhibit dedicated to John Hazel at the Lycoming County Historical Society’s Museum in Williamsport. 2 Repasz Band booklet (Grit Publishing Co., Williamsport, PA), c. 1915.
and published in the Journal of the Lycoming County Historical Society. I never met John Hazel, but I had the good fortune to play under his baton when he directed the massed bands at a high school competition many years ago. Of course, all musicians of that time had heard of John Hazel – nothing specific, just that he was famous. In 1991, the Imperial Teteque Band, of which I am a member, programmed one of Hazel’s marches, and I volunteered to do a little research on his life. What I thought would be a few days of easy research turned out to be a three-year adventure. I found some fascinating stories, such as the one about his performing before the King and Queen of England. I could find no documentation for that story; however, the true story of John Hazel’s life is fascinating enough. With the help of historians from all over the United States and from hundreds of hours of reading microfilms and interviewing many people who knew John Hazel, I have been able to put forward the following account of the great musician’s life. In the summer of 1891 in Atlantic City, New Jersey, the great American cornetist Jules Levy was appearing at one of the piers. At Schaufler’s Garden, a young cornetist with Paul Sante’s Military Band would soon be seen as a rival to Levy. Schaufler’s Garden, seating 3,000 patrons, was the largest open-air concert garden in Atlantic City; however, it was not uncommon for 4,000 people to crowd in to hear the concerts. The Garden was packed every evening; the young cornetist was praised for his ability and became very popular with the crowds. As the season progressed, opinion was about evenly divided as to who was the better player, Levy or the new arrival. Levy’s rival was John Hazel of Williamsport, Pennsylvania. John Hazel was destined to become the most famous musician the Williamsport area produced. During this golden era of brass bands, more than 10,000 such bands flourished in the United States. In a time before radio and television, these bands were a major source of entertainment. Bands were sponsored by many civic and business groups, and advertisements for job openings frequently required that the job applicant be able to play a specific instrument. Many bands attached themselves to National Guard units, providing the guards with a band for parades and ceremonies and financial support for the band. The large number of bands of the period led to the great popularity of brass instrument soloists. John Hazel was born in Bellefonte, Pennsylvania on September 28, 1865. His family moved to Williamsport when John was a young boy. John began to play the cornet at an early age. He was self-taught and spent many hours practicing and improving his tone by blowing against the brick wall of the old Elliott Paint Shop on Market Street in Williamsport. John used the famous Arban’s Celebrated Method for Cornet and said that he “blew every note in it” (Grit, February 1, 1948). When he was only ten years old, he traveled as a member of the Stopper Band of Williamsport to play at the Philadelphia Centennial Exhibition in 1876. While he was there, he heard the great Jules Levy, his future rival, and determined that he would one day be a cornet soloist. In 1877 Hazel was the only child member of the Smith Band and in 1881 joined the Repasz Band. In April 1883, he resigned from the Repasz Band to assume the directorship of the Hammer Band. John was only 17 years old, but the local papers reported: “[T]he members are becoming proficient musicians and under their new leader, who is a thorough teacher, they will rank as one of the best bands in the State” (Gazette & Bulletin, April 24, 1883). How long John remained with the Hammer Band is not known, but during the summer, he played with the Albian Hotel orchestra in Atlantic City where he performed his first public solo. He rejoined the Repasz Band and became its leader in the summer of 1887. G. Morris Repasz was the musical director. That summer Hazel spent a week as bugler for Company D, National Guard of Pennsylvania when they were encamped at Mt. Gretna. In August 1887 Hazel was to sail to England to join Buffalo Bill’s Cowboy Band at a salary of $18 per week plus expenses. Hazel went to New York, purchased his ticket, but at the last minute, he had a “change of heart.” The cause was Miss Sophie Langgans, the daughter of the Park Hotel’s pastry chef. John and Sophie were married four days later on September 1, 1887. Sophie’s father baked their wedding cake. Hazel continued to play locally, but the following June he finally joined Buffalo Bill’s Cowboy Band and spent the season with the show. Buffalo Bill’s show opened the 1888 season with performance at Erastina’s summer resort on Staten Island, followed by engagements in the New York area, Philadelphia, Baltimore, and Washington, D.C., closing the season at the Richmond Exposition. Hazel returned to Williamsport, where he was employed as an engraver with the D. S. Andrus Company; however, he did not give up his music. He played and did solo work with several bands and orchestras and gained enough of a reputation for Henry Distin to travel from Philadelphia to present him with “one of his finest cornets” (Grit, May 4, 1889). Hazel did not remain long with D. S. Andrus Company, but left to concentrate on playing, arranging, and composing music. The last march he composed during this period, “Nixie Weezle,” was so popular that demand for copies exceeded supplies. Hazel’s reputation continued to grow, and during the week of February 8, 1891, occurred what he described as the highlight of his career. He was a guest soloist with Pat Gilmore’s famed 22nd Regiment Band in New York City. This honor is equivalent to being asked to solo with today’s Philadelphia Orchestra. The Gilmore Band was the finest band in the United States at that time and was as popular and famous as the Sousa Band would later become. Gilmore offered Hazel a job with his band on the spot, but after some thought, Hazel declined the offer. We do not know why he declined, though we do know that a few months later, Hazel was playing at Schaufler’s Garden as a soloist. In light of this fact, we may assume that Gilmore had offered Hazel a position as an ordinary section player. This first summer in 1891 at Schaufler’s was to be the start of Hazel’s national career and recognition. In the summer of 1892, Hazel’s reputation grew as he joined Hadley’s National Band of Providence, Rhode Island. The New England press named him “the wizard of the cornet” (Grit, August 7, 1892). Hazel was to reach another plateau in his career when, in spring 1893, his old rival, Jules Levy, selected Hazel to take his place in the Levy-Winternitz Concert Company. Levy had taken a job at the Chicago World’s Fair. As a result, Hazel went with the orchestra on the annual spring tour throughout New England. Hazel played the 1893 summer season with the Germania Band and Orchestra of Boston in an engagement at Point of Pines, a summer resort near Boston. In the fall of that same year, he joined the Boston Festival Orchestra, and in the following spring, he got to see much of the country when the orchestra made an eight-week tour of western and northwestern states. After the tour, Hazel left the orchestra and spent the summer in a ten-week engagement as soloist back at Schaufler’s Garden in Atlantic City. Hazel, who was by this time very famous, never forgot his hometown. In breaks between tours and engagements, he and Sophie would return to Williamsport to visit. He was always very generous with his time, soloing with local bands and orchestras and instructing and directing local bands and orchestras. For example, he spent time whipping the Excelsier Band of Emporium into shape for a concert in October 1894. The concert was a great artistic success (Cameron County Press, October 25, 1894). Hazel and Levy were to cross career paths again in that same October. Levy selected Hazel to take his place in the Levy-Winternitz Concert Company for the second time. Metronome states that “Hazel was the only man considered proficient enough to take the place left vacant by Levy’s retirement” (July 1910). The orchestra went on an extensive tour to Baltimore, Indianapolis, St. Louis, and other points west. During the spring and summer of 1895, Hazel had solo engagements with the American Band of Providence, Rhode Island, the Germania Band of Boston, and the Hadley Band of Providence. In August of that year, Hazel went to New York City where he joined Luciano Conterno’s Ninth Regiment Band. He remained in New York City for eight years; little is known about his personal life during those eight years or about specific bands and orchestras with which he was associated. In a booklet entitled Repasz Band Williamsport, PA: The Oldest Band in America (Grit, 1915), Hazel’s list of positions includes “all of the leading New York Bands.” Local newspapers, including the Gazette & Bulletin, refer to him as “the wizard cornetist of New York City” (Gazette & Bulletin, May 17, 1898). In addition to playing in the Gilmore Band while under the direction of Victor Herbert, Hazel also played with Sousa’s Band for a short time, but there is no record of his being a soloist with that band (e.g., Berger, Kenneth. The March King and His Band. NY: Exposition Press, 1957). In an interview, Hazel reports that he had the pleasure of directing the Sousa Band playing one of his own compositions (Williamsport Sun, July 29, 1947). He had a contract to go with the Sousa Band on one of its European tours, but he had to cancel because of the press of other engagements (Metronome, July 1910). The band is composed of only 12 pieces. Twenty-five or more phonographs are placed in a closed room and the band is stationed with cornets and clarinets in front to secure the harmony correctly, and the musicians play one selection into each machine after which many records are made from the original. The musicians also double in orchestra and furnish accompaniment for vocalists and vaudeville artists that are engaged by the company. The band and orchestra play every day at the Edison factory. Hazel recorded quite a number of solos and duets between 1903-07. His duet partners included: Herbert L. Clarke, regarded by many as the greatest cornetist who ever lived; and Frank Seltzer, another fine cornetist. An unusual partner was Albert Benzler, who played the xylophone. Hazel and Benzler teamed up to do a novelty number entitled “Come Take a Trip in My Airship Medley” (c. late 1905). He also recorded his own variations on “Le Secret”, which would become his best known composition. The sheet music to this composition was still in print 50 years later. Hazel set to work at once to put his mark on this famous old band. The Repasz Band had started in 1831 and claims today to be one of the oldest brass bands in the United States in continuous existence. The Repasz Band booklet (Grit, 1915) states that Hazel brought to the organization experience and musical taste then needed to ensure future progress. He immediately began a systematic and thorough training for concert work, adding many compositions, including classics, to its library, with the result that the Repasz became a concert band as well as a military band. Among the Guard bands that are attending the War Governors Celebration are the Repasz Band of Williamsport and the Marine Band of Washington, D.C., yet the Repasz Band appears to have been the favorite both on the street and in concert. In addition, all three Williamsport papers of the time praised the band for its new sound. The band members also appreciated their new director; one member of the Trombone section, Charles Sweeley, who was a composer of some note, wrote a march dedicated to Hazel, entitled “Hazel’s Triumphal.” Repasz Band at that time was sponsored by the 12th Regiment of the Pennsylvania National Guard, and in July of that year, the band went to the annual encampment at Mt. Gretna. The Gazette & Bulletin reports that the band was very popular and that “Hazel’s solos never failed to draw soldiers from all quarters of the camp” (July 16, 1910). Hazel was very popular with his audiences, and he in turn appreciated them. At the end of the 1912 summer season, he asked the public to mail in postal cards with requests for numbers and solos from the more than 100 numbers played during the previous concerts. From the cards, Hazel developed the program for the last concert (Williamsport Sun-Gazette, August 25, 1912). Another local association Hazel maintained was with the Keefer Instrument Company. During Hazel’s active professional playing career, it was the custom for manufacturers to provide instruments for well-known players in return for publicity. Hazel was no exception. He played only cornets; he would never use a trumpet, not even for orchestra work. In the 1880s he used a J. W. Pepper Specialty cornet. He composed a polka named for the Pepper cornet, entitled “Specialty Polka,” which he used for an encore. 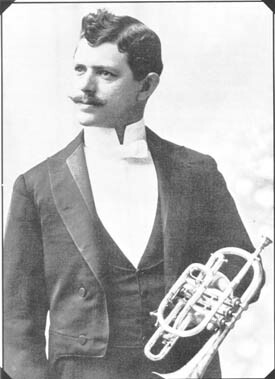 In 1889 Henry Distin presented him with a cornet; while Hazel was playing at Schaufler’s Garden in 1891, the Conn Company presented him a “handsome gold cornet.” At some point in his career, Hazel switched back to cornets made by the Henry Distin Company, which had relocated in Williamsport in 1889. Every prospective buyer was urged to ask for these fancy certificates or to “ask for when ordering.” Hazel would continue to test instruments until the company ceased manufacturing them in 1941. John Hazel’s last Keefer cornet was a beautiful custom-engraved Solotone model in silver with gold trim. Hazel’s cornet is still in existence today in this writer’s possession and is in fine playing condition. The Keefer association did not prevent Hazel from devoting much time and energy to his Repasz Band. The band continued to be very active in local affairs. Hazel and the band manager, Harry Parker, were members of the committee that arranged the construction of the Brandon Park Band Shell; the band was enthusiastically received by the 8,000 people who attended the dedication ceremony for the band shell, held on June 16, 1914. The band played many concerts on this fine stage; in fact, in those days the band frequently gave concerts in the park during the summers that followed. Besides these concerts, the band played for local high school graduation ceremonies, some college graduations, parades, and the annual Christmas tree lighting in downtown Williamsport. It was customary for Hazel to join with John Robertson (his nephew), Sherm Stutzman, and Carl Meyer on a house-to-house tour playing Christmas carols after the tree-lighting ceremony. In addition to these activities, the band still found time to travel through the state playing concerts and marching in parades. When the United States entered World War I, many young men joined the Repasz Band in hopes of going into the service with a band. The Repasz Band had served in the Civil War, leaving with the first three-months’ companies in 1861, later serving with two other regiments, and playing, finally, at Lee’s surrender at Appomatox in April 1865. As mentioned previously, the band served as the National Guard band from 1903-1912. In July 1917 Repasz split into two bands, with the younger members forming the Repasz War Band. Hazel held practice sessions for them three times a week, and in October 1917, the young band enlisted in the U.S. Navy. This Hazel-trained band became one of the best bands in the Navy at that time (Grit, October 21, 1917). Hazel wrote “Our Blue Jackets,” a march that he dedicated to this band. The civilian contingent of the Repasz Band participated in patriotic parades, including those in which drafted men were escorted to the local railroad station. In 1918 Hazel gave up playing solos on his cornet. Local sources indicate that he said he could not play properly with “store teeth.” Nevertheless, Hazel kept playing by switching to a baritone horn. He did solos with local bands, playing his “Fantasie on Irish Airs” and other cornet solos on the baritone horn. In this same year, Hazel turned over the directorship of Repasz to his long-time friend, David Gerry, who was a fine local cornetist and band director. Hazel and Gerry had performed duets many times and for a short period had published under the name of Hazelgerry Music Company. Hazel still remained active with the band, probably serving as assistant director and baritone soloist. He also continued to arrange general music for the band as well as for different instrument combinations. In one such arrangement, “Sextette from Lucia,” Hazel played the baritone part. He arranged vocal solos for guest artists who appeared with the band, and his versatility was further displayed by his arrangement of a minuet by Paderewski for reeds only. In 1921 Hazel and Gerry exchanged positions with the band, Hazel resuming the directorship and Gerry the position of assistant. In 1923 Hazel purchased a lot on Mill Street in Montoursville, a borough near Williamsport, Pennsylvania. He built a home on the site next to Loyalsock Creek. Hazel loved to fish. He had a small boat and a favorite fishing spot. He was often seen out there, fishing and smoking his ever-present pipe. Sometimes he took along music sheets, and using waterproof ink, he worked on some new idea or arrangement. Hazel kept a very busy schedule. In addition to testing for Keefer’s, giving lessons, arranging and composing music, and directing the Repasz Band, he now assumed directorship of his new hometown band. This band, like the Repasz before it, took a “giant leap” forward (Grit, May 7, 1923). The band played overtures and other challenging music. Hazel was a tough director; he wanted it played right. He did not rant and rave, but he would stop the band and say, “Let’s play it again.” He had an excellent ear and always knew which member played a wrong note. He would gently correct the erring member. Very often he would pick up any of the brass instruments and show how he wanted the number played. Surviving members of his bands remember him as a very kind man and as a very demanding director who, nevertheless, never embarrassed any player. Former members also remember playing Hazel marches and recall that Hazel marched with his band wherever they went. One example shows how decent and thoughtful Hazel was: Once Hazel marched his band to a private home so that the parents of a proud teenage player could see him perform in the new homemade uniform his mother had just finished. Sometime in the mid-1920s, Hazel ceased performing baritone solos; however, he did continue to play. He still tested horns for Keefer’s, and in the 1930s he amused young Brua C. Keefer, III by suspending two instruments from the ceiling with ropes and playing bugle calls on both horns at the same time. He continued a habit he had of “buzzing” his lips without a mouthpiece in order to stay in shape. Occasionally he would pick up a baritone horn at Repasz Band practices and play along. Repasz members of the period report that they never heard a baritone played as he played it. In addition to continuing his practice of demonstrating how he wanted something played on any of the brass instruments, he would occasionally pick up a cornet and play along with the band as he directed. The Repasz Band celebrated its 100th anniversary on Friday, August 14, 1931. A large parade with 11 bands in the line of march was held in downtown Williamsport. After the parade, Hazel directed a concert given by the massed bands, with more than 500 players participating. The next evening the Repasz Band gave a concert at Bowman Field during which a new number composed by Hazel, “Repasz Centennial March,” was introduced. Now in his 70s, Hazel continued directing, arranging, composing, and teaching. Sometimes he would attend rehearsals of other local bands and, if asked, he would direct a number or two. By 1941, at the age of 75, Hazel decided to slow down a bit and retired as the director of the Repasz Band. His wife died in November 1946; they had no children. This was not the end of his career as a director, however. In the spring of 1947, at the age of 82, a robust Hazel helped organize and then became director of the Montoursville Legion Band. The aging director was still a demanding leader and still a very kind gentleman. The members were amazed that the old fellow always knew when a wrong note was played and who made the error – just as many members of many bands had been amazed over the years of Hazel’s long career. Within months after getting the group organized and started, Hazel surrendered the baton to a younger director; nevertheless, he still attended rehearsals and would direct when called upon to do so. At this time Hazel was stricken with cancer and was forced to stop attending the Legion Band’s rehearsals. One evening, the band found itself without a director; some of the members went to Hazel’s home, directly across the street, to ask him to help them out. He agreed, and four husky band members carried him on a chair to the second floor band room. The old bandmaster conducted his last rehearsal on that night. Hazel died a few months later on January 26, 1948. An unfinished manuscript lay on his desk. The old master conducted and composed right to the very end. How good was John Hazel? There is not a doubt that he was very, very good and justly rated among the leading cornetists of his time. A July 1910 Metronome headline proclaims: “John Hazel, One of the Greatest Cornetists the World has Produced.” The article goes on to state that newspapers refer to Hazel as “the Tartini of the Cornet.” Herbert L. Clark described Hazel as “having a tongue that was loose at both ends.” Jules Levy, whose ego was a large as his talent, stated: “This fellow Hazel has an amazing technique and a facile tongue.” Brua C. Keefer was of the opinion that Herbert L. Clarke had the better tone, but Hazel the better execution. Hazel’s range extended from pedal C to high E-flat above high C. This range is not as extensive as some of the other soloists, but Hazel was justly famous for his exceptional technique. Although he was known as the “Wizard of the Cornet,” he did not always perform “fancy stuff.” A reviewer for a Philadelphia newspaper states: “Hazel’s execution of “The Last Rose of Summer” and “Nearer My God to Thee” were exceptionally fine (Philadelphia Evening Item, August 14, 1891). A New Haven newspaper gave him rave notices for his obligato work in a performance of Messiah when he was with the Boston Festival Orchestra (quoted in Grit, March 18, 1894). Every person may have his/her own favorite performer, but the experts of Hazel’s day and music historians today place Williamsport’s John Hazel among the top half-dozen soloists of his era. From the time the band arrived at the park until the flag raising ceremonies there was a concert, the most prominent feature of which was two cornet solos played by John Hazel. While he played the crowd was hushed, even the ball players ceased practice to listen to the selections (September 13, 1908). John Hazel had a long and very distinguished career. Although he reached the top of his profession, he never forgot his hometown. He returned often to solo for the home folks, and during the 37 years of his “retirement,” he devoted much of his time and talents to helping local bands and individual musicians. During his lifetime, he composed more than 75 numbers. However, Hazel rarely talked about his past; none of the living band members interviewed for this biography could recall his ever bragging. He hardly ever mentioned his past.